Richard Reoch Your Excellencies; ladies and gentlemen: with Ms. Mary Coyle, I am one of the co-chairs of this extraordinary gathering. On behalf of all of us, it gives me great pleasure to thank the drummers who performed the grand entry song: a Mi’kmaq ceremonial expression of joy and appreciation, which is used to welcome friends and visitors from other nations and from other tribes around the world. Thank you so much. 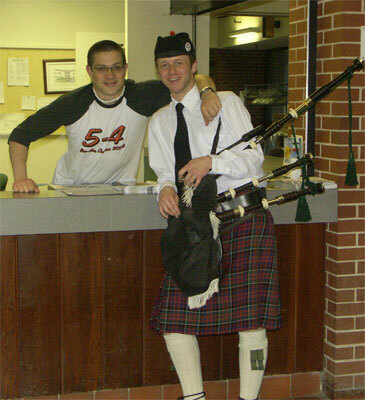 Another aspect of local culture that I would like to recognize is our bagpiper, Ian Jurink , who is a local lad from Antigonish. Thank you, Ian. I would like to introduce to you Mr. Kerry Prosper, who is a member of the Paq’tnkek First Nation, which inhabits the shores of St. Georges Bay, near Antigonish. For many years he was a Band Councillor and Chief and he is a keeper of the ceremonial staff for the Afton First Nations Sundance Society. In virtue of his extraordinary accomplishments he holds a prestigious position in his nation and is respected as a tribal elder. I now ask His Excellency Lyonpo Jigmi Thinley, the honourable minister of home and cultural affairs of the Kingdom of Bhutan, to join us. 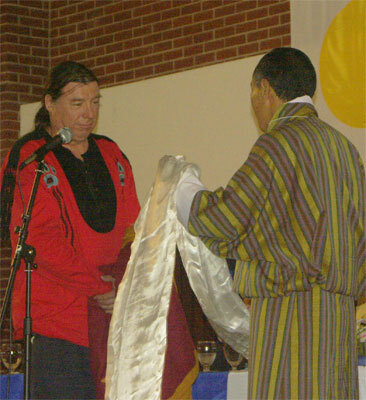 The reason I have invited these two extraordinary individuals to come up is that the inspiration for our gathering began in the Kingdom of Bhutan, represented here by His Excellency, and has now expanded into this marvelous international event which is taking place in the land of the Mi’kmaq. So there is going to be a ceremonial exchange between the representatives of these two long cultures. His Excellency will present a white kata, the traditional silk scarf of greeting and respect. 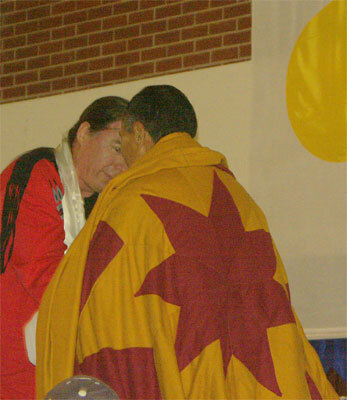 This will be reciprocated by an extraordinary star blanket, a traditional honour in the Mi’kmaq nation. Lyonpo Jigmi Thinley May you always stand tall. Kerry Prosper May you always walk with good health. It is a great honour to come here and give greetings to so many distinguished people. I would like to welcome you here to the land we call Mi’kma’ki, our traditional territory. I would like to welcome you in the same manner our ancestors did many hundreds of years ago. I wish upon you good health, happiness and long life; that your homes that you have travelled away from are always happy and in good health; that your communities are in good health; and that your nation is in good health. When we bring this all together, our Earth will become healthy. Many of our young people who are sitting here tonight, they walk a journey of prayer, developing their prayer. Many of us, including myself, stumble at times. We have to stop and rethink, and learn from our elders—where we come from, and where we are going to go in the future. So with that I wish you good health, happiness and long life. I pray that the Creator will come and give us understanding and pity us in our humble attempts to live on this Earth together. Thank you very much. Richard Reoch Thank you very much, Kerry. Today, while many of us were just arriving, has been a day in which the activities of this gathering were devoted almost exclusively to a coming together of youth and young adults. The youngest I met in the discussion group I had the opportunity to attend was a Grade 9 student from the local community. I know that this group also included university students. In the course of the day the youth had met in small groups, talking about how they could live their lives according to the Four Pillars, which are described in the theory and practice of Gross National Happiness. They spoke of how they could create a community that nurtures, supports, listens and laughs. They discussed the creation of natural buildings, and how to help lead other people in developing an understanding of living in harmony with each other and the planet. As a result of that, the young people who have spent the day together have created a performance that they want to share with us now. So I invite them to come forward to this open space. Youth Over the past four days, we youth have come together to form a very tight-knit community. We have had group discussions in which everyone has given input, everyone’s input has been heard, and we have all received input. We have trust in each other’s words, in our listening, in our leaders, and in our work. It is for this reason that we have good governance in our community of trust. Youth Equality. Connection. Cultural and social cohesion. In only a few days, through open-mindedness, acceptance and unconditional love, we have melded our diversity into community. Youth Sustainable economic development, natural building, and renewable resources. A dream of a world where the Earth is valued more than the dollar. Youth Three days; seventeen youth; and two beautiful, naturally environmentally-friendly buildings—we have created a community that loves and respects the environment. We have come together in our own love of the Earth, for environmental conservation. Richard Reoch I would now like to invite Dr. Sean Riley, president of St. Francis Xavier University, to address us. Sean Riley Thank you very much. Your Honours Myra Freeman and Lawrence Freeman; Your Excellencies Minister Thinley and Ambassador Penjo; our own Honourable Angus MacIsaac, minister in the government of Nova Scotia; distinguished guests ladies and gentlemen; entertainers; and friends all: I would like to extend a very warm welcome to everyone at the conference and also to the campus of St. Francis Xavier. We are honoured to be hosting and sponsoring this conference of thinkers and of practitioners from across the globe and from all regions of Canada. We are particularly delighted to welcome back our colleagues from Bhutan, our honorary alumnus Ela Bhatt, and many other friends and alumni of the Coady International Institute. We are thrilled that so many of you have been able to join us. 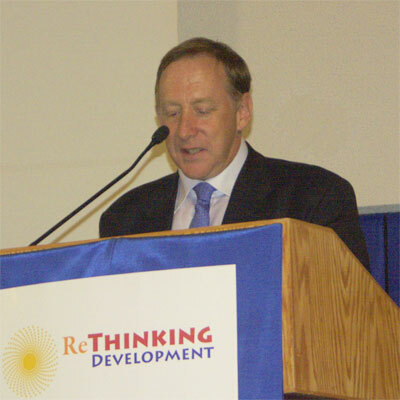 When I was thinking of this conference, and thinking of the flow of ideas and the tremendous ways of development that take place in the human spirit, three events came to mind. One occurred last year; another, several decades ago; and the third set of events is about to take place. Last year, as many in the room know so well, our colleagues from Bhutan held the 1st international conference on globalizing the concept of Gross National Happiness. I have no intention of preempting Lyonpo Jigmi Thinley’s address tomorrow morning on the meaning of Gross National Happiness—he is the expert and we are awaiting his remarks very anxiously. All I want to point out is that measuring progress through indicators beyond the traditional economic ones is always a challenge. And equally challenging is the task of ensuring that a society’s progress goals and development plans take into account the culture, the environment, just and fair economic practices, and—as was mentioned just a few moments ago by our youth presentation—the whole concept of good governance. Finding ways of putting those ideas into action was the work of last year’s conference in Bhutan. In the present, as we are on the campus of St. F.X., I cannot help but also think of a set of events that took place here several decades ago under the leadership of Dr. Moses Coady, Jimmy Tompkins, and other leaders in the Antigonish Movement. There were, as many in the audience will know, people’s schools on the economy, where the farmers, fishers, miners, woodlot owners and other citizens would gather to discuss economic realities and the context in which they were working and living. Dr. Moses Coady became famous among that group for challenging people to get the knowledge and skills they needed to make better lives for themselves through cooperative efforts. In many ways, this campus has been the home for much of the cooperative and credit union movement and also a great deal of the adult education movement across Canada. Those are two sets of events—one last year in Bhutan and one here several decades ago. But I think we also look to see progress through events that are yet to take place. One such event, which will take place during the first week of July in Scotland, is the meeting of the G8 hosted by Tony Blair. At that meeting an important topic of discussion and decision will be support for development in Africa and also, in a broader sense, the question of responsibility and collaboration at the international level. If I mention these three events by way of introduction, it is such a truth that history links our communities in ways that we can barely imagine. Whether it be the concept of Gross National Happiness taking root in the discourse of the world and our own society, or whether it be the organizational efforts of communities around the world seeking to control their own destiny, we are all linked together in that great enterprise, and we all have a great responsibility to make a contribution. You will have a tremendously exciting and diverse group of speakers and participants at this conference. 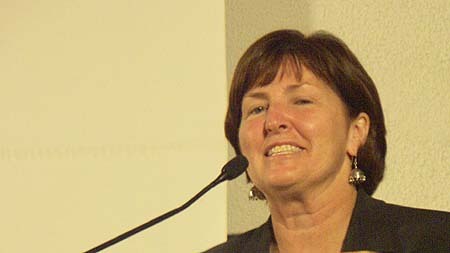 Every single one is a leader in some aspect of her or his own community, and I wish every single participant a tremendous welcome to the campus of St. Francis Xavier University, the home of the Coady International Institute. Thank you. Mary Coyle It is my absolute pleasure and honour to be here co-chairing this exciting conference. It is a delight to see such a great group of people. When we started to think about this idea just a little over a year ago, none of us could imagine that there would be such a diverse group of resource people and of participants. It is going to be an exciting few days together. As co-chair, I want to welcome the many distinguished and honoured guests from our own backyard, from our region, and from around the world. With us this evening we have the Honourable Myra Freeman, Lieutenant Governor of Nova Scotia, His Honour Lawrence Freeman, and their son Daniel Freeman. That is an honour as well, to have another member of the Freeman family here at St. F.X. I would like to ask Her Honour if she would please come and address the conference.